PRWeek has revealed the finalists for the PRWeek Awards 2013, which will take place March 7 in New York City at the Grand Hyatt. A group of more than 75 esteemed judges from across the industry narrowed 800-plus entries to finalists in 35 categories on Monday at the Sentry Centers in New York City. Christine Cea, Unilever's marketing communications director, is serving as chair of judges for the awards program. This year, PRWeek has added the “Communicator of the Year” award, which will be given to an individual deemed to be the most outstanding communicator in the period covered by the awards, October 8, 2011, to October 5, 2012. That individual could come from within or outside the PR industry. More than 1,000 attendees celebrate the industry's biggest night every year, where awards are selected by a group of the most esteemed judges from across the PR world. 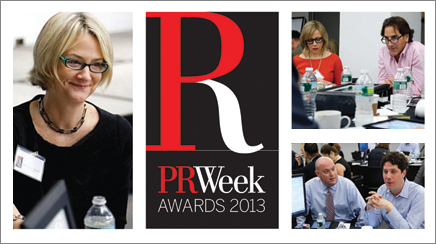 To book your ticket to the 2013 PRWeek Awards dinner, click here. Availability is limited. Flashpoint Public Relations and LEGO Systems: LEGO Duplo Read! Build! Play! Carmichael Lynch Spong is a full-service firm that ignites and sustains momentum for a select portfolio of blue-chip clients. As a testament to the work the agency does on behalf of its clients, Carmichael Lynch Spong is proud of its 300+ award-winning campaigns. The agency is also the industry's three-time recipient of the "Agency of the Year" award by national trade journals The Holmes Report and PRWeek. FedEx., FedEx Corp. (NYSE: FDX) provides customers and businesses worldwide with a broad portfolio of transportation, e-commerce and business services. With annual revenues of $43 billion, the company offers integrated business applications through operating companies competing collectively and managed collaboratively, under the respected FedEx brand. Consistently ranked among the world's most admired and trusted employers, FedEx inspires its more than 300,000 team members to remain "absolutely, positively" focused on safety, the highest ethical and professional standards and the needs of their customers and communities. For more information, visit www.news.fedex.com. PRWeek's 2009 and 2010 "PR Education of the Year" winner, the M.S. in Public Relations and Corporate Communication offered by the NYU School of Continuing and Professional Studies provides cutting-edge curriculum that is grounded in theory and practice, and is immediately applicable to your work environment. Its faculty of industry professionals bring unparalleled insight to the classroom. PR Newswire (www.prnewswire.com) is the premier global provider of multimedia platforms that enable marketers, corporate communicators, sustainability officers, public affairs and investor relations officers to leverage content to engage with all their key audiences. Having pioneered the commercial news distribution industry 57 years ago, PR Newswire today provides end-to-end solutions to produce, optimize and target content — from rich media to online video to multimedia — and then distribute content and measure results across traditional, digital, mobile and social channels. Combining the world's largest multi-channel, multi-cultural content distribution and optimization network with comprehensive workflow tools and platforms, PR Newswire enables the world's enterprises to engage opportunity everywhere it exists. PR Newswire serves tens of thousands of clients from offices in the Americas, Europe, Middle East, Africa and the Asia-Pacific region, and is a UBM plc company. Ford Motor Company, a global automotive industry leader based in Dearborn, MI, manufactures or distributes automobiles across six continents. With about 172,000 employees and 65 plants worldwide, the company's automotive brands include Ford and Lincoln. The company provides financial services through Ford Motor Credit Company. For more information regarding Ford and its products worldwide, please visit corporate.ford.com. Business Wire, a Berkshire Hathaway company, provides press release and multimedia delivery into news editorial systems worldwide. Choose from hundreds of industry and geographic circuits – we'll optimize press release content for search engines, post to thousands of websites and add social media sharing functionality. And, our innovative online newsroom hosting services and measurement reports provide additional communications tools. Learn more at BusinessWire.com and the BusinessWired blog; follow updates on Twitter: @businesswire or on Facebook. Ogilvy Public Relations is a global, multi-disciplinary communications leader operating in more than 70 markets around the globe. We blend proven PR methodologies with cutting edge digital innovations to craft strategic programs that give clients winning and measurable results for corporations, government agencies, trade associations and not-for profit-organizations. The firms' seven specialized practice areas are healthcare, consumer marketing, public affairs, corporate, technology, social marketing and 360 degree digital influence. Weber Shandwick is a leading global public relations firm with offices in 81 countries around the world. The firm has won numerous awards for innovative approaches and creative campaigns, and it has deep expertise in social media and digital marketing. Visit us at www.webershandwick.com. Established in 1956, GolinHarris is a holistic communications firm designed and built to help clients win in a complex digital world. We have 39 wholly owned offices located in the Americas, Asia Pacific, Europe and the Middle East. Our core practices include consumer marketing, corporate communications, digital and social media, corporate social responsibility, healthcare, internal communications, multicultural marketing, technology and public affairs. Kwittken+Company is an elite communications agency that provides its clients with results that extend far beyond traditional PR. We work with brands in the media/publishing, travel, luxury, fashion/retail, design, healthcare, financial services, technology and b-to-b sectors to help them realize their business goals through intelligently designed, results-oriented campaigns. MSLGROUP is Publicis Groupe's flagship strategic communications and engagement network. We are a next-generation agency network that creates and celebrates data-driven big ideas and communications solutions in the digital age. We aim to be our clients' most trusted advisor, source of unbound creativity, engagement and value in the "always-on conversation." As creative storytellers for this conversation age, we offer a truly holistic approach to communications that is story-based, multi-specialized and channel neutral. Hill+Knowlton Strategies is a leading international communications consultancy, providing services to local, multinational and global clients. The firm is headquartered in New York, with 86 offices in 46 countries, as well as an extensive associate network. The agency is part of WPP, one of the world's largest communications services groups. Zeno Group is the marketing communications agency committed to helping clients make the most of the new realities of audience engagement and the evolving role of PR. Zeno employs more than 90 professionals in offices based in New York, Chicago, Los Angeles, Dallas, Toronto and Silicon Valley. The firm specializes in marketing consumer, health and technology brands. In a category being introduced this year by PRWeek, the Judges Chair and PRWeek editor-in-chief will select the outstanding communicator in the period covered by this year's Awards. The individual could come from within or outside the PR industry. Allison+Partners is an international communications firm driven by a collaborative approach to innovation and creativity. The result is freshly imagined, customized approaches that provide concrete, measurable strategies to drive market and executive leadership. Expertise includes consumer PR and marketing, corporate communications, technology and digital media, brand innovation, social impact, public affairs and healthcare. Padilla is an integrated communications firm that has helped organizations build and protect their brands and reputations for more than 50 years. We're grounded in the art and science of corporate communications, investor relations and marketing communications, and we've expanded and innovated to provide social media and creative services. Visit us at www.padillaspeer.com. Ketchum is a leading global communications firm with operations in more than 70 countries across six continents. Ketchum has won more awards on behalf of its clients than any other firm including an unprecedented three consecutive PRWeek Campaign of the Year Awards. It also was named Large PR Firm of the Year by both the Holmes Report and PR News earlier this year. With five global practices - Brand Marketing, Corporate, Healthcare, Food & Nutrition, and Technology - as well as more than 20 specialty areas, Ketchum partners with clients to deliver strategic programming, game-changing creative and measurable results that build brands and reputations. Ketchum's brand promise is captured in two words: break through. For more information on Ketchum, a unit of Omnicom Group Inc. (NYSE:OMC), and how we can deliver break through solutions for your business, visit www.ketchum.com. Synaptic Digital, a Definition 6 company (www.synapticdigital.com), is the premier content creation and multichannel distribution company for brands, organizations, and their agencies globally. Clients like General Motors, Siemens, Honda, Procter & Gamble, American Express, GlaxoSmithKline, Google, Intel, NATO, Ericsson, and others rely on our news expertise, production and distribution services, satellite and radio media tours, interactive news releases, digital media centers, and thenewsmarket.com, a global community of journalists and influencers, to manage their messages across on-air, online, social media, and syndication networks. Candidates are the respective winners of the Boutique, Small, Midsize, and Large PR Agency of the Year awards, to be announced at the ceremony on March 7. TV Access specializes in messaging for nonprofit organizations. Our experience and results in PSA distribution is unparalleled in the industry. TV Access is uniquely qualified to provide distribution for any PSA campaign. We have been providing PSA services for over 40 years. We have always recognized that we are in a service business and go out of our way to provide exceptional service. In 2011, we distributed over 300 Television, Radio, Out-of-Home, Transit, or Alternative media campaigns for nonprofits and government agencies. Candidates are the winners of the campaign awards, to be announced at the ceremony on March 7. After each of the campaign awards has been determined, the Judges Chair and PRWeek's editor-in-chief convene to discuss those entries in depth. The group in narrowed down to a final five, and from those, the PR Campaign of the Year is selected.